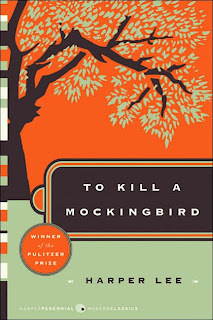 I finished reading Harper Lee's Pulitzer prize winning "To Kill a Mockingbird" yesterday, and wasn't disappointed. Having an older brother of three years, the relationship between Scout and Jem was of special interest to me and I found the relationship they had with their father special. The innocence of a child is so prevalent in this book, but so is their special wisdom, which came across as instinct to me. I spend most of my time reading light or chick lit books, but found this book very engaging and couldn't put it down. It's also opened my eyes to a whole other category of books to read and I hope I find something else as special as this. I'm going to pick up the movie to watch this week, while it's still fresh in my mind. I don't expect the movie to be as great as the book, as it was Scout's thoughts that really captured my attention, and well, it's difficult to get those kind of thoughts across on screen.
" Naw Jem, I think there's just one kind of folks. Folks." I've never read it ... will I like it? Ohhhhhhhhhhh ... this is probably one of my most favourite books. And the movie with Gregory Peck is also one of my all time favourite movies. They're both classics. So worth reading. And that's a great quote you chose.